Looking for something special? One of a kind? Just ask me! Most all pieces are one of a kind. If you see something you like, let me know! I can create your special piece for you specifically. 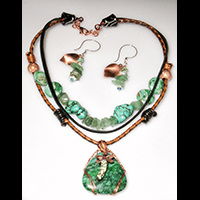 Inspired by my visits to the coast, this collection features gemstones such as cultured pearls, Swarovski crystals, magnesite, turquoise, marble, aquamarine, tigereye, and much more! 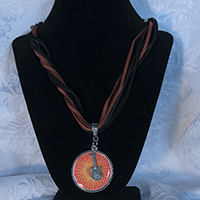 Most pieces are Sterling Silver, some using Hill Tribes sterling. 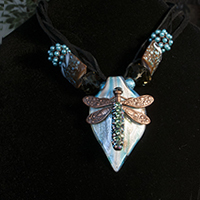 Most have magnetic clasp ends, some have dragonfly toggle ends. 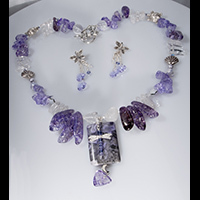 Inspired by the dragonfly having a special place in my heart, these pieces utilize the Swarovski crystal them: Love Story of the Heart and feature Swarovski's Truly in Love, Wild Hearts & More of their collection. 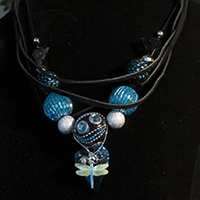 Dragonflies lay on these giant hearts with most piece strung on leather with lobster claw ends. Growing up in the 70's, Peace & Love still remains a part of my life as we all aspire this in your lives. 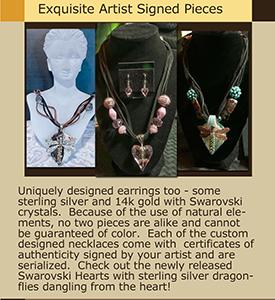 Gemstone necklaces featuring a sterling or gemstone peace sign for Men & Women. Also, bringing back the mood stone! 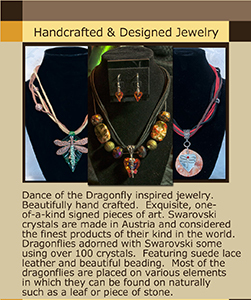 Plenty of affordable fashion jewelry, all handmade! Seasonal delights! Enjoy seasonal makings any time of the year! come with an octagon shaped mirror to aide in their beautiful reflections. Each figure comes with a certificate of authenticity signed by Donna T.
Swarovski elements glide along the skin, throwing out shards of color in sync with the wearer's every movement. Just as Swarovski's crystal elements have captured and reflected the changing face of femininity over the course of time, these designs embody the essence of today's woman. Crystal elements made by Swarovski, with their extraordinary luster, warmth, and depth, their infinite unfolding reflections and intriguing dualities - fire and ice, material and immaterial - are now treasured as 'precious', versatile, and vibrant in their own right. 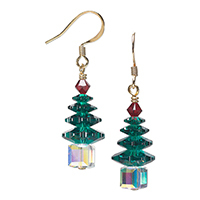 Swarovski crystals are high-quality Austrian crystals. SWAROVSKI ELEMENTS sets the world of jewels alight. In recent decades, Swarovski's mesmerizing crystal elements - those versatile little drops of desire scintillate with the light of life, the dance of dreams, and the daring dynamism of creativity - have become an essential ingredient of contemporary design. SWAROVSKI ELEMENTS bring innovative and artistic visions to life. Today, creatives everywhere know and love them for their brilliance, quality, and wide variety of colors, cuts, shapes, textures, and translucencies.